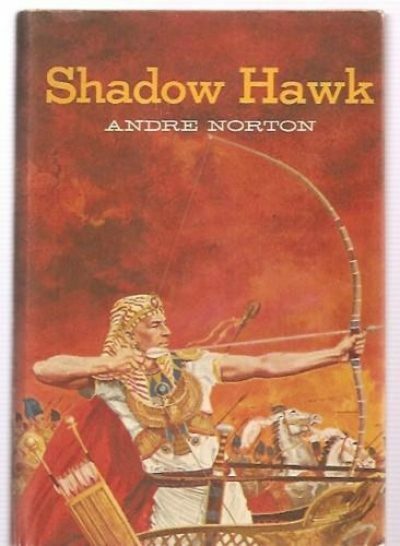 With 1960’s Shadow Hawk, Andre Norton steps away from science fiction for historical fiction, abandoning space ships and alien worlds for chariots and an ancient Egypt subjugated by the Hyksos. It is Egypt’s Second Intermediate Period. The Hyksos have used their mastery of the horse-drawn chariot, previously unknown to Egypt, to conquer the lower reaches of the Nile as far south as Thebes, forcing many of Egypt’s aristocracy to pay fealty to them and others, like Prince Rahotep’s mother, to flee south. Pity poor Rahotep, too close to the throne, too far from power. His birthright of the Striking Hawk Nome was lost when his mother fled south. While he is the son of Ptahhotep, the Viceroy of (nominally loyal) Nubia, he is only the second son. Correctly believing that his half-brother Unis has designs on his life, Rahotep avoids the court and serves his father the Viceroy as the leader of an archer unit in a remote post near Nubia’s border with the Kush. When Viceroy Ptahhotep dies suddenly, under dubious circumstances, Unis acts quickly to seize power. By the time word of Ptahhotep’s death reaches Rahotep and his men, Unis is firmly in control. It can only be a matter of time before he has his half-brother Rahotep eliminated. Before Unis can get around to having Rahotep murdered, word comes from Thebes that the legitimate Pharoah Sekenenre is preparing to rise up and drive the Hyksos invaders out of Egypt. Rahotep manages to escape Nubia with his archers; they make it to Thebes, where Rahotep is invited to join Sekenenre’s court and his archer unit is added to Sekenenre’s army. Nobody in Thebes has ever seen archers on a par with the Nubian Desert Scouts; they may well turn the tide in the coming war with the invaders. Unfortunately for Rahotep, the court at Thebes is even more of a snake-pit than the dusty provincial court where Rahotep grew up. Not everyone agrees that it is the time to move against the hitherto undefeated Hyksos. If Sekenenre’s mind cannot be changed on this matter, well, there are ways to send Sekenenre home to the land beyond the sunset. And if a certain provincial soldier is discovered standing knife in hand over a badly wounded Pharoah, so much the better for the conspirators…. Once again I am reminded of how little I know of Egypt’s Second Intermediate Period. I have the impression that while Norton is faithful to Egyptology as it was known in 1960, the field has since moved on. Norton’s Hyksos are yet another product of the great Central Asian Nomadic Barbarian factory; the current consensus is that the Hyksos were probably Middle Eastern in origin. The Hyksos of this book are mere demon-worshiping barbarians, at least in the eyes of Norton’s Egyptian aristocracy, who believe that all those who differ from the Egyptian ideal are lesser humans. Norton is kinder in her descriptions of Rahotep’s Nubian archers; she knows that they are a valuable addition to the Egyptian army, even if the aristocrats dismiss them as just another gang of barbarians. I am not sure of the word-count for this novel but it feels longer and more convoluted than Norton’s science fiction. Perhaps the guidelines for historical fiction were looser than for they were juvenile SF. Despite the change in genre and the atypical focus on an aristocrat, this is clearly a Norton novel; Rahotep may be an aristocrat, but he has lost his lands and occupies a fairly humble position. For much of the book, Rahotep is kept busy escaping plots against him and clearing his name. As soon as the court politics slow down a bit, he immediately undertakes an extremely dangerous mission deep into enemy territory. This was an interesting little palate cleanser that left me with a sudden desire to reread Christie’s Death Comes as the End, which is also set in Thebes (if I recall correctly), but a couple of centuries earlier than Shadow Hawk. This seems to be something of an oddity among Norton books. While I had no trouble tracking down a used copy of the 1979 Fawcett Crest edition, an online search reveals no edition more recent than a 2001 trade paperback from Bethlehem books. It may be that as a historical it falls too far from Norton’s perceived home genre (SFF) and so is not considered worth keeping in print. 1: Unis should have been a lot more concerned about scheming Prince Teti, who deposes Unis and establishes Nubia as an independent kingdom.